The Bay Area (more fully, the San Francisco Bay Area), ringing the San Francisco Bay in northern California, is a geographically diverse and extensive metropolitan region that is home to over 7 million inhabitants in cities such as San Francisco, Oakland, and San Jose. Once a focus of Spanish missions and Gold Rush prospectors, the Bay Area is best known now for its lifestyle, liberal politics and high-tech industry (Silicon Valley). 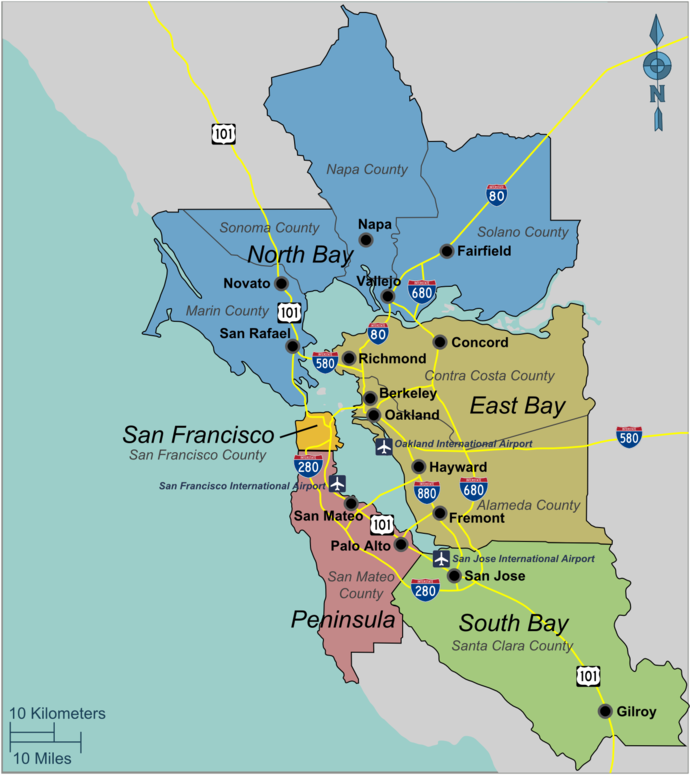 Although it doesn't have any firm boundaries, the Bay Area includes portions of nine counties: Marin, Sonoma, Napa, Solano, San Francisco, San Mateo, Contra Costa, Alameda, and Santa Clara. San Mateo and the northern part of Santa Clara counties comprise the Peninsula while Contra Costa and Alameda counties comprise the East Bay of the Bay Area. The southern parts of Sonoma and Napa counties are considered part of the Bay Area for this guide, since their culture and economies face towards the Bay. To the East and South, whether outlying towns such as Gilroy and Santa Cruz are part of the Bay Area or the Central Valley/Central Coast respectively will depend on who you ask. A small region of its own, the Bay Area still has distinct areas with their own attractions and cultures. 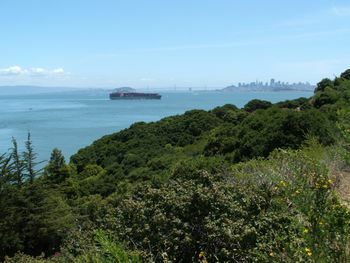 The sub-regions of the Bay Area are described several ways, which may give the first time visitor the impression that the Bay Area is bigger than it really is. In fact, the unique geography of the Bay Area makes it relatively easy to get a sense of where you are. The de facto center from which directions to various regions in the Bay Area are made. Where you arrive when you cross the Golden Gate Bridge from San Francisco and includes Marin, southern Sonoma, southern Napa, and Solano Counties. Lies across the bay from San Francisco, and includes Contra Costa and Alameda Counties. Oakland is the most populous city in the East Bay. Berkeley, Concord and Fremont are also destinations. Stretches south down from San Francisco across San Mateo County and into the northern parts of Santa Clara County. South of the Peninsula and the East Bay, includes most of Santa Clara County, and is anchored by the most populous city in the Bay Area, San Jose. Here's a handy rule of thumb: the telephone area code 415 generally means San Francisco (although it includes a few nearer parts of the North Bay like Marin); 650 is the Peninsula, 510 and 925 is for the East Bay, 707 for the North Bay or Wine Country and 408 and 669 are for the South Bay or the Santa Clara Valley. Note that the boundary between Peninsula and South Bay is not formal; some locals, and some other sites/guides may place some of the northern Santa Clara County cities categorized here as "Peninsula" as South Bay - for example, the local Craigslist does so for Mountain View. There are scores of cities that surround the Bay; these are some of the most famous. Berkeley - Known for its free speech movement that surrounded the UC Berkeley campus. Napa - Famous for high quality wine and upscale, tourist friendly shopping. Oakland - A hub of African American culture, as well as the birthplace of the Black Panther Movement. Palo Alto - The base for a large amount of big name technology companies; such as Facebook. San Francisco - The cultural and economic center for all of Northern California. As well as being the birthplace of several liberal movements. Vallejo - Home of well known musicians like: E-40, Mac Dre and Sly Stone; as well as NASCAR driver Jeff Gordon. Vallejo first gained national recognition as a result of murders committed by the Zodiac Killer within city limits. Stockton - Interstate 5 and State Route 99, inland California's major north-south highways, pass through the city. State Route 4 and the dredged San Joaquin River connect the city with the San Francisco Bay Area to its west. Silicon Valley — a shorthand for the computer industry as much as a meta-region within the Bay Area, comprising parts of the South Bay and southern Peninsula. Temperate in summer and mild in the winter, the Bay Area is an excellent place to visit year-round. The weather in the Bay Area is affected by microclimates, so certain parts of East Bay can be up to 15 degrees warmer than downtown San Francisco, and as much as 20 degrees warmer than the area around the Golden Gate bridge. Generally the closer to the ocean one goes the cooler it is, it is suggested that one keep that in mind when traveling around the area. There are three major airports in the San Francisco Bay Area: San Francisco International (IATA: SFO, located about 10 miles south of the city) is the largest, a major international airport with numerous passenger amenities; Oakland International (IATA: OAK), in the East Bay) is smaller and serves destinations in the U.S. and Mexico; and Mineta San Jose International (IATA: SJC), in Silicon Valley) serves the U.S. and only a few international flights to Mexico, and Tokyo. All are served by discount airlines such as Southwest, though OAK and SJC tend to have more low-cost flights than SFO. All three airports may be reached by inexpensive public transit (SFO and OAK are both served by the regional BART system, though OAK requires a separate shuttle bus ride), though SJC is the most inconvenient to San Francisco (SJC is served by San Jose's VTA Light Rail and the regional Caltrain line). Private pilots should consider Oakland (ICAO: KOAK) rather than SFO, as the separate general aviation field there is more accommodating to light aircraft. Amtrak, +1 800 872-7245,  serves the Bay Area with long-distance and intercity trains. Two long distance trains, the California Zephyr  to Chicago and the Coast Starlight  between Seattle and Los Angeles, serve the Bay Area with stations in Martinez and Emeryville, with the Coast Starlight also stopping at Oakland's Jack London Square Station and San Jose. From Emeryville, passengers may take an Amtrak California  Thruway bus over the Bay Bridge to San Francisco's Amtrak stop at 101 The Embarcadero (near the Ferry Building) and usually several other downtown destinations (note that Amtrak passengers are not subjected to any extra charge for the bus). Two shorter distance Amtrak routes also serve the Bay Area: The Capitol Corridor  runs 16 times daily (11 on weekends and holidays) between Sacramento and Emeryville, with some trains also serving San Jose, with connections to Caltrain in San Jose, Amtrak bus at Emeryville, and BART at Richmond or the Oakland Coliseum station. Additionally, the San Joaquins  runs 4 times daily between Bakersfield, Stockton and Emeryville. Travelers on the San Joaquins can connect to Amtrak bus at Emeryville or the BART at the Richmond station. For both trains, discount BART tickets can be purchased in the cafe car. From the east, the entrance to the Bay Area is superhighway Interstate 80, which winds its way all the way from New York several thousand miles to pass through Lake Tahoe and Sacramento and end up in San Francisco. From the south, the lovely Highway 101 runs from Southern California through the Central Coast to Silicon Valley and up the Peninsula to San Francisco. Some people prefer Highway 5, which travels more directly through the San Joaquin Valley to highway 580 and then into the Bay Area through the East Bay. From the North Coast or the Pacific Northwest, the story is similar. Coastal highway 101 is more scenic, while highway 5 is efficient but somewhat boring. Interstate 5 intersects interstate 80 in Sacramento, however, when coming from the north, Interstate 505 can be used to bypass Sacramento and get to the Bay Area quicker. Parking rates in San Francisco can go up to around $30. You can park at BART parking lots: For example: Park in Colma parking garage $2 all day, free weekends and round trip BART from Colma to Moscone Center would cost $6.50 for one person, so two people could park and train for $15 as opposed to $25 for all day parking at the center. Greyhound serves the United States. Companies such as Megabus, BoltBus and others run services from Sacramento, the Central Valley and metropolitan Los Angeles to the Bay Area. The Bay Area is well served by a network of freeways. Highways 280 and 101 run up the Peninsula from the Silicon Valley to San Francisco, and 101 continues into Marin County across the Golden Gate Bridge. Highways 880 (also called the Nimitz Freeway) and 580 run the length of the East Bay, and Highway 24 runs out to Contra Costa County. All major freeways, particularly those going through San Francisco and Oakland, suffer from severe congestion at commute times. Interstate 280 and the South Bay freeways and expressways tend to be less congested than the Peninsula and East Bay freeways. For a slower but vastly more scenic route, the Pacific Coast Highway (also known as PCH and Highway 1) runs along the coast. In many places this route may not be appropriate for those prone to car sickness or fear of heights, but for all others it provides an unforgettable vista over the Pacific Coast. Note that many Bay Area freeways tend to have dense traffic at any time of day or the evening, any day of the week (even Sundays), and you will be lucky if traffic is actually moving at the speed limit (rather than far below it). This is particularly true of the Eastshore Freeway in Berkeley and the James Lick Skyway in San Francisco. Other freeways, such as Interstate 280 on the Peninsula, are congested only during rush hours on weekdays and are relatively easy to drive at all other times. You can get traffic reports 24 hours a day from several radio stations, most notably KCBS (740 AM and 106.9 FM) which has traffic and weather reports every ten minutes on the eights (:08, :18, :28, :38, :48, and :58). There is a proportion of "hurried" drivers that will zig-zag between cars at high speeds. In the North Bay, there are fast succession of freeway interchanges; a misunderstanding may land you on the wrong freeway, even on a bridge you do not intend to take. Interchanges are signposted with road numbers and compass directions, but even these may be confusing: the same stretch of road may carry several numbers and opposite compass directions between these numbers. Read a map carefully before driving or have a passenger watch for directions. Note that since tolls are charged only one-way on the toll bridges, you should plan road trips to minimize the number of times you traverse bridges in the toll direction. Toll bridge pricing can be hard to estimate, even for locals, so consider using this handy tool to know what direction the tolls are in and what the prices are for each bridge: (Bay Area Tolls ). 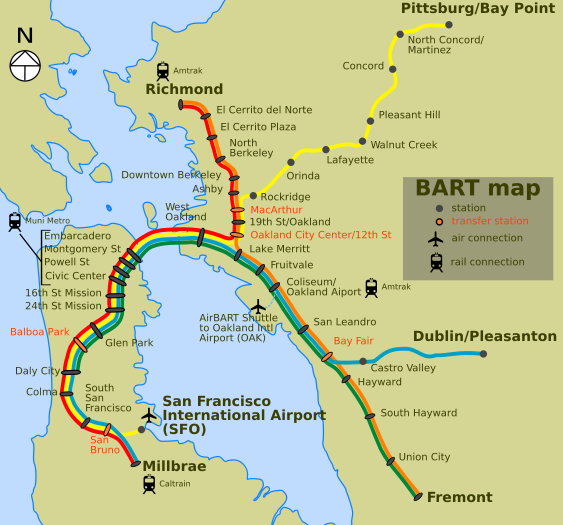 Bay Area Rapid Transit (BART ) is an extensive regional metro system that connects San Francisco to the East Bay, as well as parts of the Peninsula, the eastern half of Silicon Valley, and the San Francisco and Oakland airports. BART is also useful for getting around within SF and Oakland. Ticket prices vary by distance travelled, but usually run about $2-5 one way and tickets can be purchased from vending machines at any station. You will need to insert your ticket into barriers when entering and exiting the system. Tickets hold a balance, deducting the appropriate price for each trip, so someone who plans to use the system several times can buy a $10 or $20 ticket and not worry about fares until the card is used up. Note that the BART vending machines accept any credit card only twice within any 24 hour period. Trains run about every 10-20 minutes starting around 6AM and closing just after midnight. 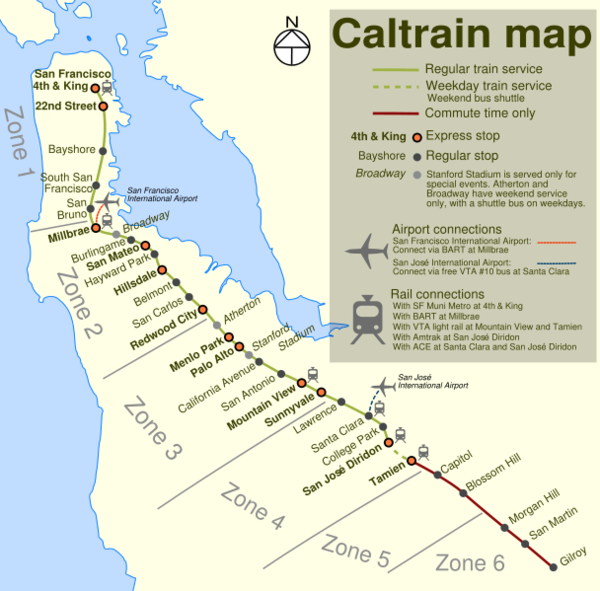 Caltrain is a commuter train system running along the Peninsula between San Francisco, San Jose and Gilroy. Ticket prices vary by the distance between stations, but usually run around $3-6 one way. Trains run about once every hour on average, with several more trains running during commute hours. This train service is not particularly fast; however, in a move to improve speed, many trains during commute hours run express or semi-express service, so they do not stop at all stations. Tickets must be purchased before boarding the train from ticket vending machines at any of the stations or from ticket clerks at staffed stations. Tickets are checked on the trains and anyone found without a ticket is liable to a substantial fine. Cyclists should use the designated car at the northern end of the train, and be aware that bike space is often limited during commute hours. The Amtrak Capitol Corridor is a regional train that can be used for longer travel distances in the East Bay, as well as to go to San Jose and avoid a transfer from BART in Fremont. A full list of Bay Area public transportation agencies, as well as a refreshingly useful trip planner, can be found at the Metropolitan Transportation Commissions's web site 511.org. Golden Gate Ferries, +1 415 455-2000 . Runs regular service between San Francisco and Larkspur and Sausalito. Blue and Gold Fleet, +1 415 705-8200 . Runs ferries between San Francisco and Sausalito, Alameda/Oakland, Tiburon, Vallejo, and Angel Island, with additional service to Angel Island from Alameda/Oakland and Vallejo. BayLink Ferry, +1 877 643-3779 . Offers service between San Francisco and Vallejo. San Francisco Bay Ferry, . Runs various services between San Francisco and the East Bay. Heaviest services during rush hour. Also South San Francisco to Oakland/Alameda. The famous cable cars run up and down the hills of San Francisco and offer quite a ride. Alcatraz, the former Army post, then federal prison on an island in the San Francisco Bay, today a National Park Service museum. Ferries depart from Fisherman's Wharf in San Francisco. The Golden Gate Bridge linking San Francisco and Marin County to the north is often called one of the modern wonders of the world. Cross the bridge by car and after taking the first Marin County exit make your way up to the Marin Headlands which overlook the bridge, the entrance to San Francisco Bay and the City itself. Muir Woods in Mill Valley is a beautiful forest with some of the few remaining old-growth redwood trees in California, many over 300 feet (90 m) tall. Point Reyes National Seashore is a very scenic stretch of coastline in Marin County with isolated beaches, rocky cliffs, and a historic lighthouse. Mt. Diablo State Park in the East Bay near Walnut Creek rises 3,849 feet above the area and provides some very dramatic views of the Bay Area and the Central Valley. A road travels to the observation tower and small museum at the top. The San Francisco Bay Area has a broad array of cuisines from various countries of Africa, Asia, the Americas, and Europe. While San Francisco probably has the widest variety of any of the Bay Area cities, locals will often tell you to go outside of San Francisco for the best of some cuisines, such as Fremont for Afghan or Indian or Pakistani, Burlingame for Jewish, or Redwood City for Mexican. The area has also developed its own array of localized Chinese cuisines; this started in San Francisco and has expanded throughout the Bay Area in recent years. Peet's Coffee and Tea, at the corner of Walnut and Vine in Berkeley, . Founded in 1966 as a pioneering effort to bring fresh-roasted "gourmet" coffee to the American palate, Peet's coffee shop started a revolution in American coffee tastes. When Starbucks was founded in Seattle, they initially bought their coffee from Peet's. Peet's is now a medium-sized chain with locations in several areas of the United States. As part of the coffee revolution, you will also find many fine independent coffee shops throughout the Bay Area, as well as the ubiquitous Starbucks, which has more locations than McDonald's. With a few notable exceptions, the parts of the Bay Area of interest to tourists are as safe as any other major North American city. However, special care should be taken in a few areas, when going "off the beaten path" or when travelling through unfamiliar residential areas. While locals (and those from elsewhere in California) will generally be able to recognize poorer or high crime areas even when unfamiliar with the specific area, the signs of dangerous areas and slums are not always the same as in other American cities, let alone those abroad. Certain parts of the Bay Area are plagued by high crime rates. The very worst areas are primarily residential/industrial and not of much interest to tourists or travellers - these include the Southeastern section of San Francisco (Bayview-Hunter's Point, Sunnydale, Visitation Valley), the town of East Palo Alto, West Oakland and much of East Oakland, some parts of Hayward and San Leandro, The Monument Corridor in Concord, Bay Point, San Pablo, Central Richmond, the East parts of Redwood City and San Jose, and Vallejo. San Francisco's Mission District, SOMA(South of Market), the Tenderloin/Civic Center, and the Western Addition in San Francisco. Oakland downtown and around Jack London Square. Berkeley around the University of California Campus. Even outside of "dangerous" areas, within the major cities (San Francisco, San Jose, Oakland and other developed parts of the East Bay) keep aware of your surroundings and utilize the same common sense as in any major urban area. Certain neighborhoods, including the Mission District in San Francisco and many poorer parts of San Jose (such as Alum Rock) and the East Bay have a high degree of gang violence. This will not be such an issue in major shopping centers or on busy commercial streets. There are also many rough neighborhoods in many of the poorer suburbs throughout the Bay Area: these include but are not limited to the cities of El Cerrito, Pittsburg, Antioch, El Sobrante, South San Francisco, Daly City, Union City, San Rafael, Fairfield, and Santa Rosa. If in doubt, ask a local if the area is safe. Central Coast - The rugged section of coast south of the Bay Area that includes Monterey Bay and Big Sur. San Joaquin Valley - California's bread basket in the Central Valley. Sacramento Valley - Home of the state capital. North Coast - Located to the north of the Bay Area and home to massive redwoods and remote coastline. This page was last edited on 8 March 2019, at 08:40.